Choose the right voltage for all you electronic projects with this high powered Fixed DC Power Supply. Includes input and output short circuit protection as well as built in over temperature and over current shutdown. Wide input range allows for voltage regulation of 16VAC and 24VDC supplies*. Newly improved with a standard 2.1mm DC jack and terminal header output connector for easy hookup. The unassembled kit includes instructions (including schematic and parts placement) and all the components to build one complete Fixed DC Power Supply. A soldering iron, solder and a pair of cutters are required for assembly. Precise voltage regulation up to 1A with no additional heatsinking*. 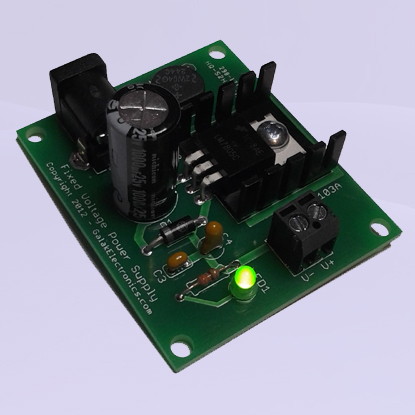 Operates with both AC or DC voltage with fully rectified input. Takes standard DC coaxial plug for use with DC adapters. Input and output short circuit protection diodes. Wide input supply voltage up to 24VDC or 16VAC. * Maximum voltage differential from input to output should be less than 10VDC for full current.